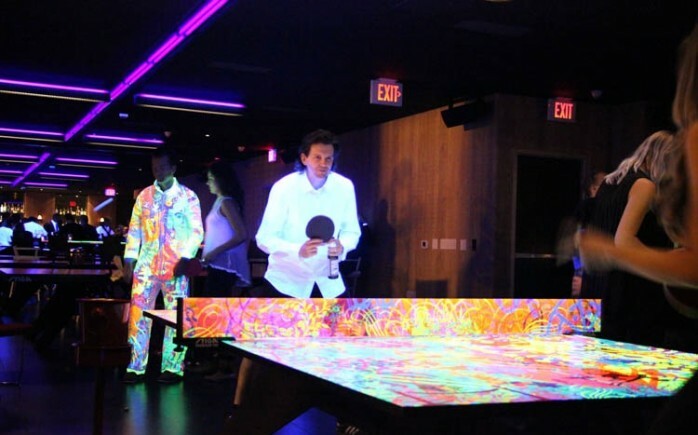 Recently, Ryan McGinness unveiled a custom black light ping-pong table that he designed for SPiN Standard at The Standard, Downtown LA. The New York-based artist stuck true to his graphic style for this custom table, utilizing his trademark iconography and design aesthetics to convey a complex and poetic concept. Take a look the photos below as well as a video documenting the Glow-Pong launch party hosted by McGinness, Kohn Gallery, Maker Magazine, and Quint Contemporary. http://vimeo.com/77823328 Discuss Ryan McGinness here.